A couple/three or four weeks ago a book by a mother of children with Fragile X came out. I was thrilled. I've exchanged emails with the author for awhile now and was dying to read her story. I finished it in less than two days, which is saying something considering how little time my kids give me for things like getting engrossed in a book. Leeann Taylor is the mother of five children, three of whom have Fragile X syndrome. For anyone with even just one child with Fragile X, the idea of three of them - plus two more typical children - is nearly unimaginable. You might remember her from her Fragile X Writers Story that appeared here. 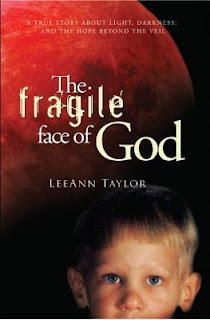 Her book, entitled "The Fragile Face of God," details her experiences in raising her large family with the complications, headaches and heartaches that Fragile X introduces into the mix. I related to LeeAnn's story right from the first paragraph - a little section I'd like to quote here, but I have already loaned the book out to a friend and don't have it sitting beside me right now. I also talked another friend into buying it. Suffice it to say, I thought it was an amazing story and a great read. Her story begins with her childhood. LeeAnn lost her mother when she was a little girl, and was without maternal support or any kind of female role model during her most critical growing-up years. She reached adulthood very naïve and innocent, but like a lot of little girls, with big dreams. She planned to delay marriage and children in order to fulfill her dreams of becoming an actress, but life had another plan entirely for her. When we're young we really think we've got the world on a string, don't we? She met and married her husband and father of her five children almost immediately after high school. She kept a journal while raising her young family, and she found that she tended to write only about the positive things that happened in their lives, and didn't really express her frustrations and trials. The reality of raising children with disabilities was quite a bit different from what she recorded. Her journal entries contrast starkly with her account of what life was really like. Reading the date of each of her journal entries, I'd recall myself during that time, and at the age she was, and tried to imagine myself raising extremely challenging children in my early 20s. I try to imagine raising my own challenging children when I was in my early 20s. I thought she was extremely kind when talking about her husband, considering that it seems to me he behaved rather selfishly, and failed to recognize how desperately his wife and children needed help. Of course, he is still her children's father and always will be, and I can understand not wanting to blame or alienate him. He was young and idealistic, just like she was. So many aspects of her story sounded like mine. Poop, everywhere, all the time. Every day. Not being able to have nice or pretty things around the house because the kids literally destroy everything they get their hands on. I tend to decorate with unbreakable things - I like to have books around. They are easy to pick up and hard to break. I hang quilts on the walls. Easy to yank down, but for the most part unbreakable. The story builds to a climax I can completely relate to personally. While driving home from a challenging outing, her son is having a meltdown in the back of the car, hurting his brother and endangering the others, and behind the wheel on the highway, she's powerless to stop it. Unbearable heartache. 1. Clearly, LeeAnn's two boys with Fragile X are some of the most severely affected boys I've ever heard of. If you are new to the Fragile X diagnosis, keep in mind that all children with Fragile X are different from each other and that this is the story of two extremes. I would even go so far as to say that with early diagnosis and therapy, most kids with Fragile X are capable of leading much more sociable and positive lives. I say this because had I read this during the first year after our diagnosis of Fragile X, it would have scared the bejesus out of me. 2. One of the things that has stayed with me from the Partners in Policymaking training I did last year is the concept of People First language. It really does make a difference how people are viewed and judged when you call them "people with disabilities" rather than "disabled people." I think it's a little bit subliminal - in general, people don't necessarily know that the wording you use changes the way they think. Throughout the book LeeAnn refers to the boys as "disabled," and while part of me can understand wanting to stress the effects and damage their disability caused on their ability to live their lives, I think in the long term and in our world today, stressing their standing as human beings first and foremost is more important. The Fragile Face of God is a story that will stay with me for a long time. If you have kids with disabilities, you should check it out.